Help, Flies are Bothering my Cat! Flies can be both annoying and harmful because they bite cats to feed on them. We don't often think of flies biting but that's what they do. They usually attack areas that have less fur, such as the eyes and ears. Once they've pierced the skin, they can start a cycle of feeding that is often hard to stop. It's also possible that Kanisa has some dried or cracked skin around those areas that attracts the flies. Prevention is key and it begins with a good brushing regimen. Use a soft bristle brush to remove loose hair and dead skin from Kanisa's coat every day. As you're brushing her, you can examine her skin and see if there are any sores or dry spots. Best of all, Kanisa will probably love the extra attention! We would be remiss if we didn't mention that the best remedy that we've found for insect pests is keeping a cat indoors. Almost every cat will live a longer, healthier life indoors away from predators and other environmental threats. If you must allow Kanisa outdoors, you can use a topical spray like Cedarcide to deter biting insects, including flies and fleas. 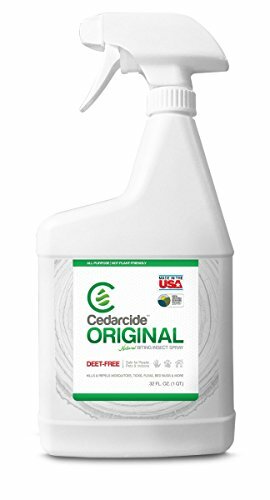 Cedarcide is an all-natural product that can be safely used on any animal that will tolerate the scent. It has a strong scent because it's made from cedar oil, but many people find it pleasant. There's a reason folks used to store their woolens in cedar chests. Cedar oil is both a deterrent and a killer of pests while remaining completely safe for cats, dogs, and humans. It's important to note, however, that Cerdarcide isn't safe for use with rodents or birds. Apply the oil with your hands and rub it in so that it gets down to Kanisa's skin. Our cats have never minded the smell, but every cat's different. Try a little bit on her coat in an area she can easily reach and see what her reaction is. If she tolerates it without trying like crazy to clean it off, she probably won't mind a little bit rubbed onto key areas where the flies are swarming. Be extra careful around her face and make sure to keep it away from her eyes, nose and mouth. Many will suggest using essential oils, but those are potentially harmful to cats. The same goes for chemical "spot-on" flea repellents. Those should be used with great restraint. Yes, there are those cats who benefit from their use, but there are some individuals who have very bad reactions to some of the chemical ingredients. Sally, we hope you're successful at making Kanisa a little more comfortable during these summer months. All our best wishes!